Delia Smith never stores eggs in the fridge. Quote - "for most cooking purposes eggs are better at room temperature". By storing eggs in the fridge door the temperature and humidity around the egg is raised and lowered every time you open and close the fridge door, this is not good for your eggs. Egg shells are pourous, eggs absorb the smells, odours and flavours from anything stored in close proximity. 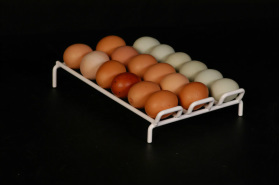 This unique egg rack is also a great egg organisor, keeping your eggs in order of freshness. It will hold eggs of all shapes and sizes that will roll down freely without getting stuck. Why the Egg 'N' Roller ? 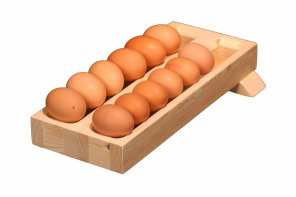 Most people store eggs In the fridge, when in fact there is no need, kept at room temperature eggs will last for weeks, you will never see supermarkets storing their eggs in the chiller cabinet. The egg n' roller is handcrafted wlth a slight incline, meaning when you take the egg from the front of the queue, the next egg will roll down automatically to replace it, keeping you safe in the knowledge of which egg is the freshest. Just top up your eggs by placing new eggs at the back of the queue and have peace of mind that you'll always have a perfectly fresh egg! Not only is the egg 'n' roller a functional item for the kitchen, but it's also a design centrepiece that will grace any kitchen, you can paint,varnish or stain your wooden egg 'n' roller or simply leave natural to show the beauty of the wood. Which ever you choose your egg 'n' roller will always look amazing wherever you put it. or High Quality Plastic Coated Wire. COPYRIGHT © 2011. 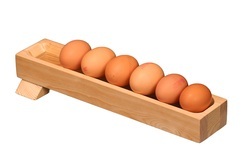 EGG 'N' ROLLER THE EGG STORAGE HOLDER RACK ALL RIGHTS RESERVED.